In the summer of 1984 I was unhappy with the progress of my artwork. I felt the need to change my routines in order to try to shake something fresh out. Not having done much still life work, I decided to set up this arbitrary arrangement in my studio and vowed to spend some time with it. 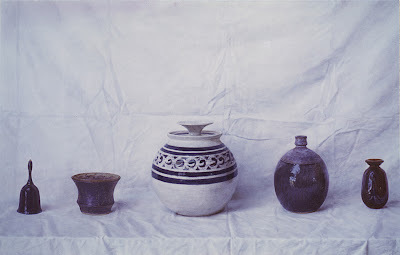 The objects were plopped down alongside each other pretty casually--I didn't want them to be "artfully" composed. I worked on the painting for several weeks, and remember getting completely absorbed in that wrinkled white cloth. I was amazed at the incredible range of subtle color that was in the whiteness (this bad photo doesn't do it justice.) The longer I looked, the more I saw. It was a maddening, humbling, exhilarating lesson in the discipline of simply looking. 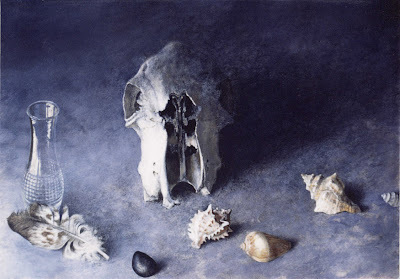 I didn't know it then, but this painting was the beginning of six months of still life painting that took me down a completely unexpected but exciting path of new explorations. This painting was done several weeks (maybe months) later. I was getting increasingly interested in experimenting within the still life format. I wanted to find ways to surprise myself; to make the paintings more open-ended, less pre-planned. For this piece I decided to build a kind of unpredictability into the painting process itself. None of these objects were ever placed together in this arrangement. I would set one thing on the table and draw it on the paper. Then I would remove it and place the next object to draw, choosing an almost random placement. In this manner the design grew organically over time, and the space each object occupied was, in a way, only in my mind. Don, it's a frustrating time for you with the "techie" problems you're experiencing and I hope it is sorted soon for your sake. BUT, what we would have missed in your reflections of the past 20 years or so of work and these absolutely wonderful paintings. It sounds dramatic but they make me feel humbled and even priveleged to just put a bit of paint on the end of a brush and keep going! I love Trespasser by the way. It is so powerful in its simplicity. Thanks Don for sharing this earlier work. This is a beautiful painting, as are so many of these earlier pieces you're sharing. Thank you for letting us take a look. I'm inspired! Boy, Sheila, what a fine compliment--can't tell you how much I appreciate that. Thank you! Don your past works are quite different from your current ones, they were much tighter huh? Are you feeling more expressive these days or in the past? Each style is beautiful and amazing in its own way! But since I don't have the tenacity to paint that tight, I can definitely relate more to your newer pieces. Did your style get more relaxed about the same time you surrounded yourself with cows? :) I hope your tech probs gets resolved soon. Thanks kindly for the note! Hi Erika, thanks for the comments and questions. My feeling of whether I'm being more or less expressive varies moment by moment, depending on the mood I'm in and how well or poorly the painting is going. It has always been that way. History shows that lots of painters seem to get looser in style as they age. Not sure it has anything to do with cows. Probably just bad eyesight. I don't much about art or what private collections mean, but I know what I like and I love this painting. Do you make copies of ones like this to sell or anything? I especially loved Trespasser and was wondering specifically about that one too.